I don’t know about the rest of you but although I cook a meal for my family just about everyday, there are some days where I have absolutely no idea what to make. Lately I’ve been in that kind of a rut, and it doesn’t help that we’re going through some renovations around here. It’s discouraging to think about cooking when part of the home is covered in plastic and there’s dust everywhere. However, going to the grocery store and allowing myself to be inspired by what’s available or what’s on sale does help. I love the color purple and it was definitely not difficult to be inspired when I saw these eggplants last week. I don’t usually find Chinese eggplant in my local grocery store and I most often stick to Italian eggplant when making Pasta alla Norma. But these were too beautiful to pass up. Just look at that gorgeous colour! So I decided why not use Chinese eggplant in my Pasta alla Norma. 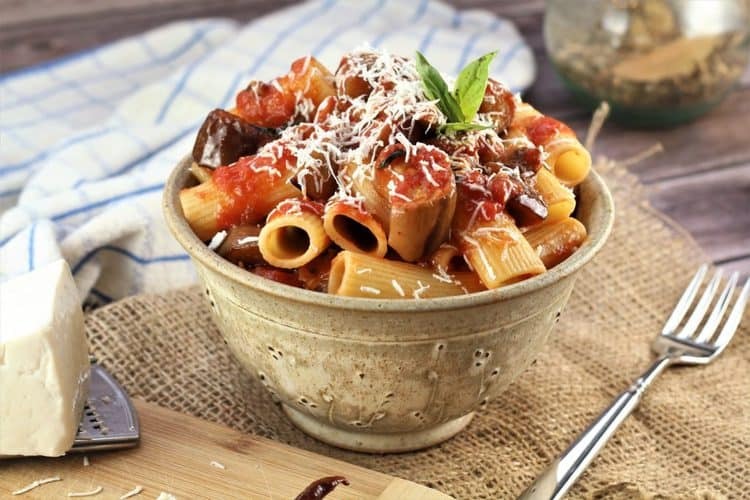 Pasta alla Norma is the perfect dinner for someone who doesn’t want to spend too much time in the kitchen and wants to serve a wholesome family dinner using a few simple ingredients. 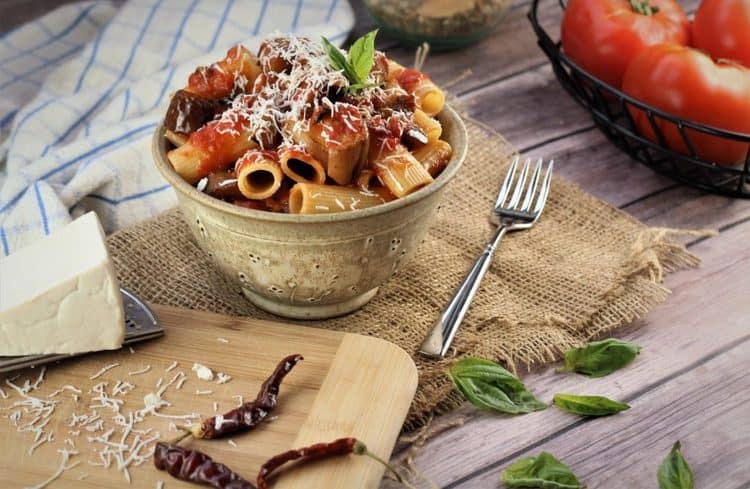 Pasta alla Norma is also a classic Sicilian dish. Why Sicilian you ask? The name was inspired by a famous opera entitled “La Norma”, composed Vincenzo Bellini who was from Catania. The use of eggplant is very typical in Sicilian cooking as well as the ricotta salata which is essential when serving this dish. Ricotta salata is basically ricotta which has been pressed, salted and aged and therefore has a much tangier, saltier flavor compared to plain fresh ricotta. Pasta alla Norma must absolutely be served with salted ricotta and not parmesan cheese, otherwise it just isn’t Pasta alla Norma! You can find ricotta salata in any Italian supermarket or a good cheese shop. 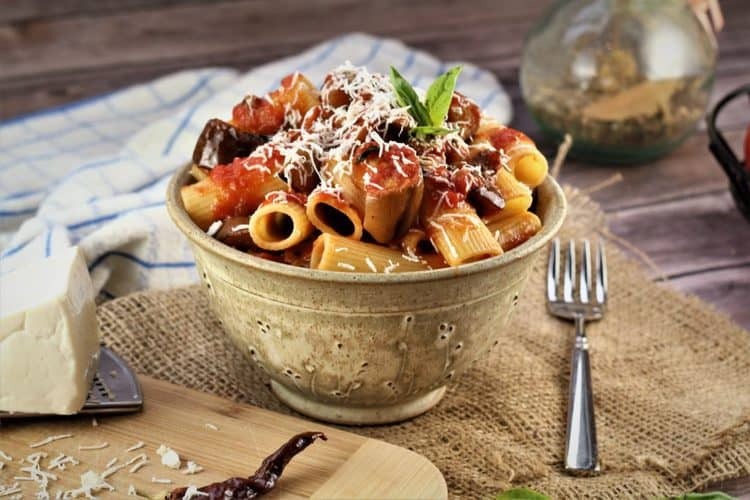 This recipe consists of very few ingredients, however as in all Italian recipes, it is of upmost importance to get the best quality and freshest ingredients you can find. I use canned whole Italian tomatoes, fresh eggplants, ricotta salata, a good quality extra virgin olive oil and fresh basil for garnishing. 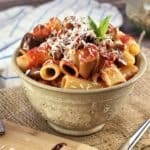 As for the pasta, I prefer rigatoni or any other short pasta, such as penne rigate, which tends to adhere to the sauce much better. But of course, it would be just as good even if you prefer spaghetti. Unlike most recipes for Pasta alla Norma, I prefer oven roasting my eggplant rather than frying. 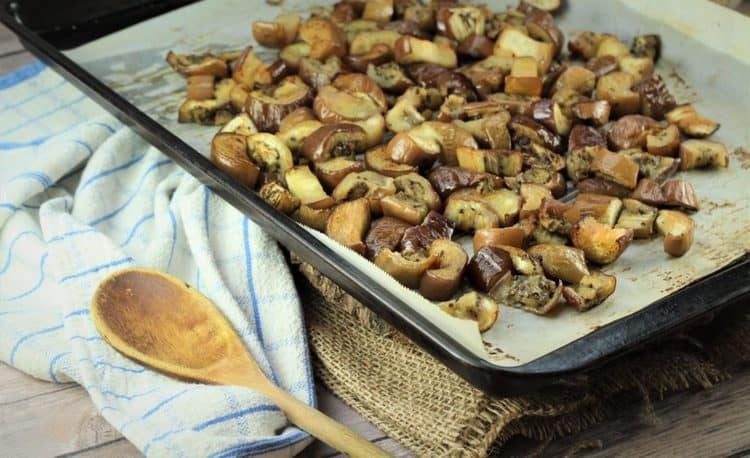 It is easy, fuss free and I like how the eggplant browns evenly in the oven when tossed with plenty of olive oil and salt. 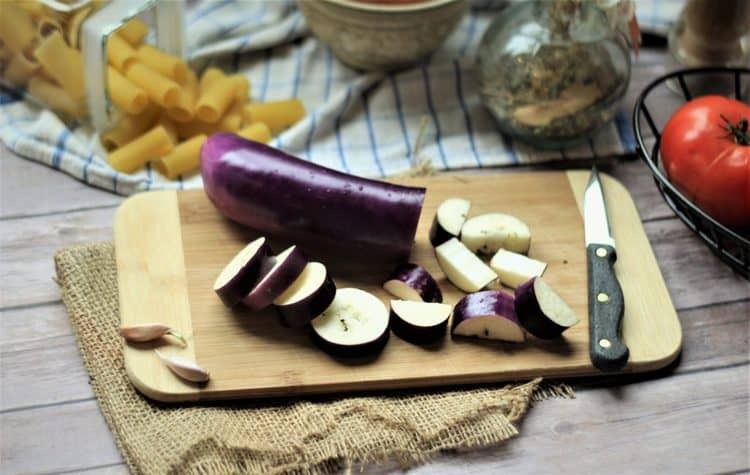 While the eggplant cooks, I use this time to prepare the sauce and begin cooking the pasta so the whole meal comes together easily. And finally, don’t forget to serve your Pasta alla Norma with plenty of freshly grated ricotta salata. You’ll notice I didn’t provide any quantity of cheese in my recipe and that’s because there’s no limit to the amount of cheese I can add to my pasta! Just pass the ricotta salata and the cheese grater around the table and let everyone help themselves. Buon appetito! 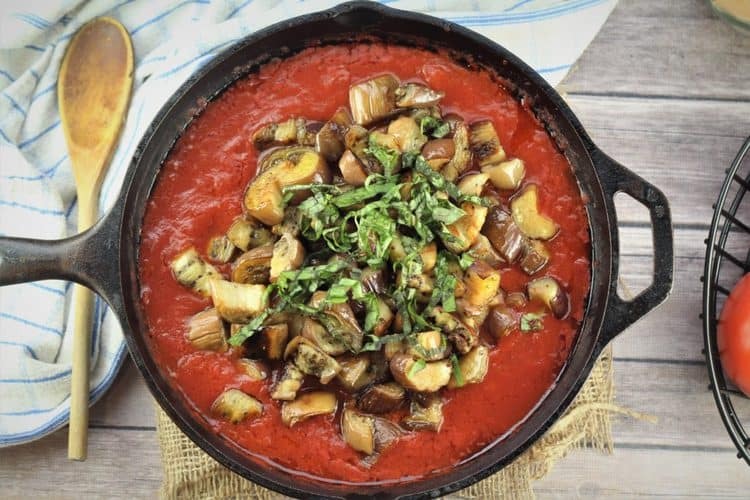 Pasta alla Norma is classic Sicilian pasta dish consisting of a few fresh ingredients: eggplants, tomatoes, garlic, basil and the essential ricotta salata for serving. Dinner will be on the table in no time! 1 can whole Italian tomatoes 796 ml. 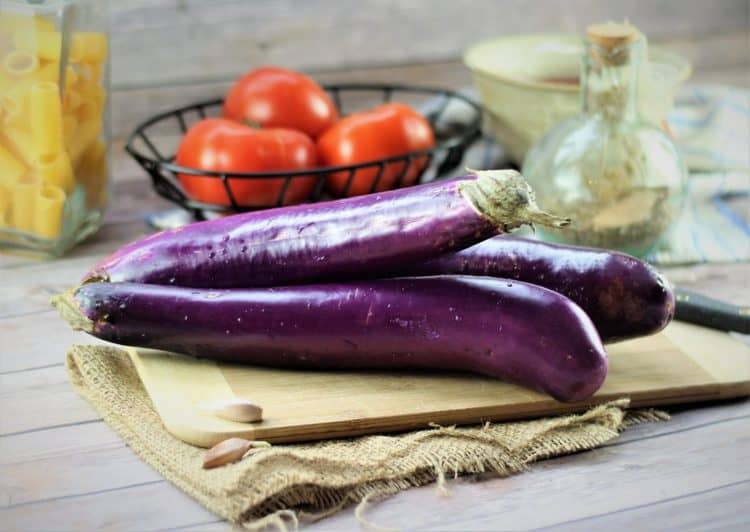 Toss eggplants with 3 tbsp of olive oil and salt and place on a baking sheet. Bake for 30 minutes, or until the eggplants are golden and tender. In a large skillet, heat the remaining tbsp. of olive oil and add garlic. Using your fingers, crush the tomatoes into small pieces, add to the skillet and bring to a boil. Season with salt and red pepper flakes (if using) and simmer while the eggplant cooks. Meanwhile, bring a large pot of water to a boil and cook pasta until al dente. Add the roasted eggplant to the sauce and stir to combine. Simmer on very low heat until the pasta is ready. Add the cooked pasta to the pan with the sauce and eggplant and stir gently to combine. Garnish with chopped basil leaves. Serve with grated ricotta salata. Hi Gina, I buy my ricotta salata at a local Italian grocery store. My mother actually used to make her own and I must try one day!